Clump #58: Take random items to post office and send to older daughter. This reminded my daughter of a quote from the series Battlestar Galactica, which I looked up: (Spoken by the leader of the rebel Cylons) “In our civil war, we’ve seen death. We’ve watched people die. Gone forever. As terrible as it was beyond the reach of the Resurrection ships, something began to change. We could feel a sense of time, as if each moment held its own significance. We began to realize that for our existence to hold any value, it must end. To live meaningful lives, we must die and not return. The one human flaw that you spend your life distressing over … Mortality is the one thing … Well, it’s the one thing that makes you whole.” I haven’t watched Battlestar, but that quote really spoke to my mood and preoccupation. I sent this same daughter a package with a few thing I’ve been meaning to get to her for way too long. 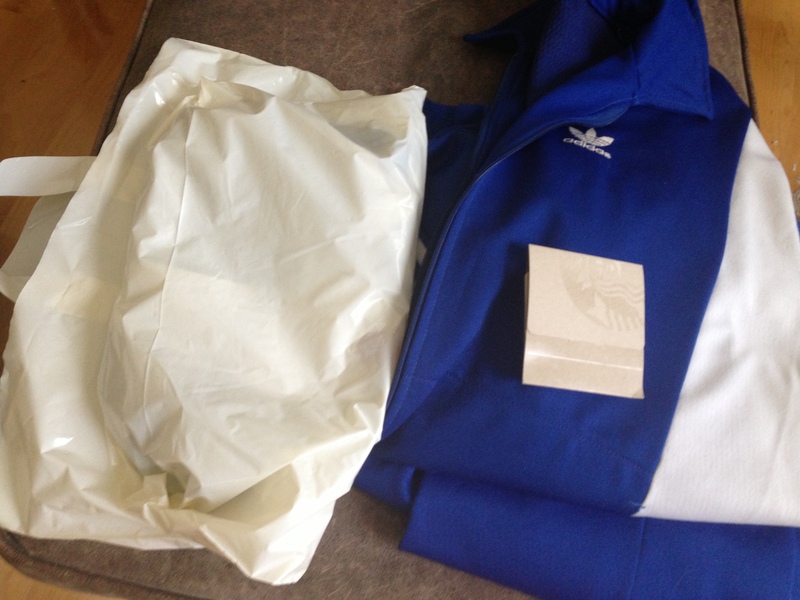 I included my dad’s old — vintage — warm-up suit to give to a good friend of hers. This is truly the last of the parent-clothes to release. A weight is lifted. 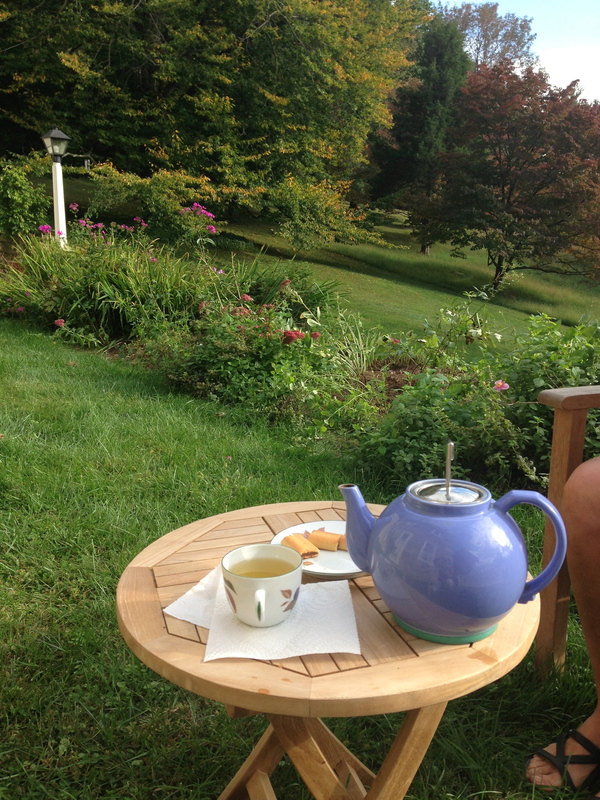 I gave a Reiki treatment to a good friend and was richly rewarded with tea in her beautiful garden. 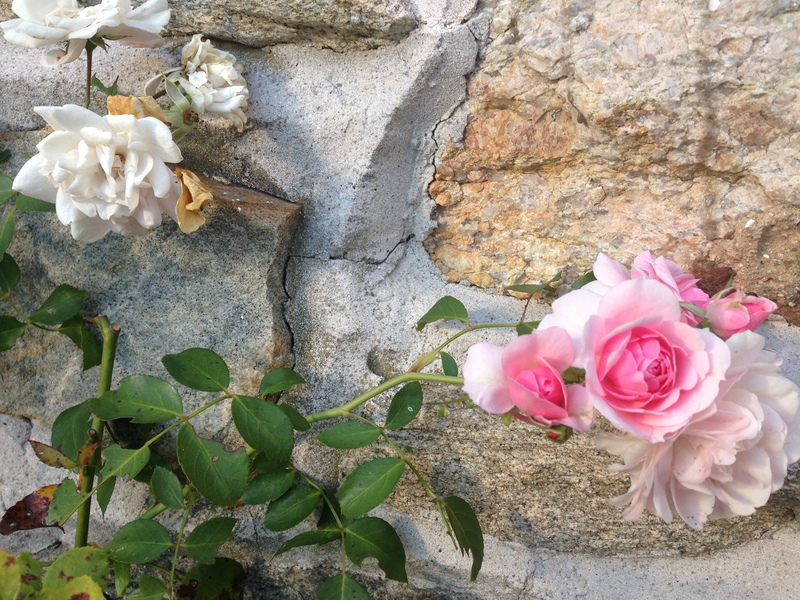 I couldn’t resist taking pictures of the roses by a stone shed. Don’t we appreciate late September roses more because we know their season is almost over? Oh my gosh these photos are gorgeous, you have been given such an eye for beauty. 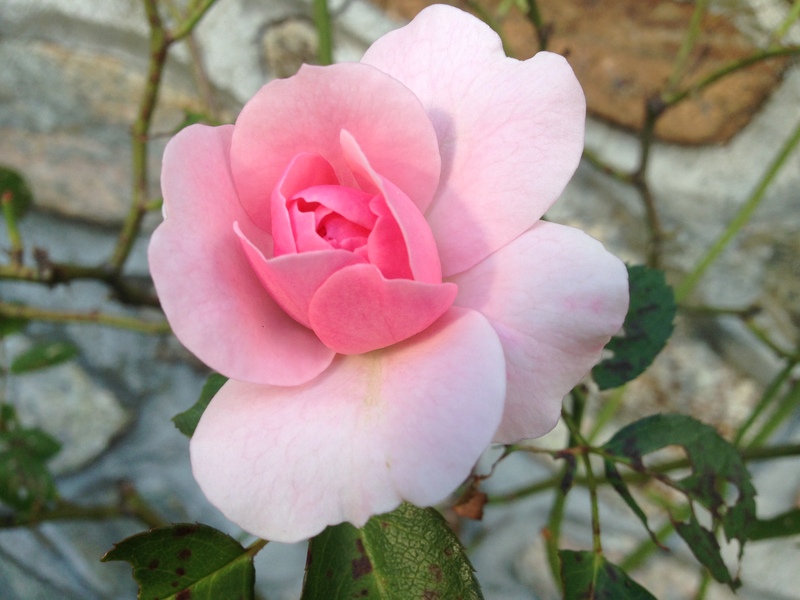 The rose blossoms against the stone I could gaze at for a long time …. the colors…the textures….the contrasts…. 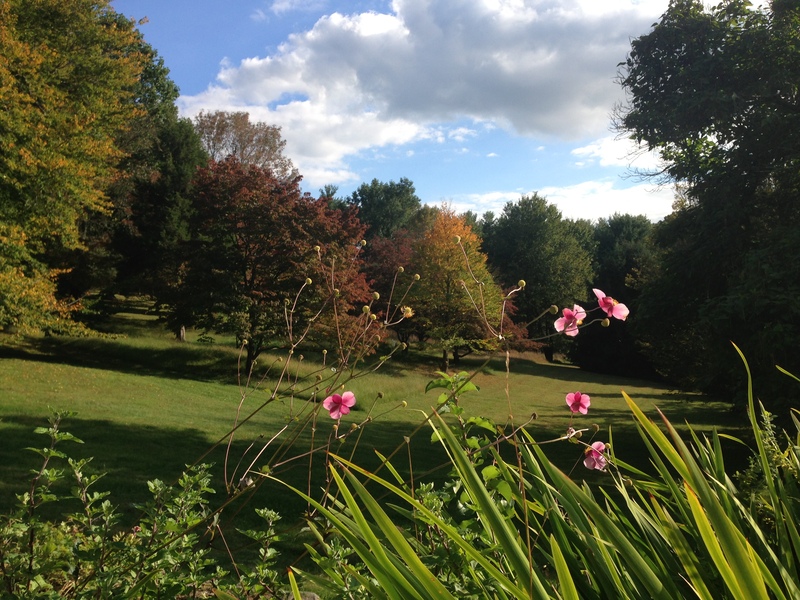 This post makes me want to share a book with you, “The Quiet Eye,” by Sylvia Shaw Judson, a Quaker. Must go — I’m off to gather natural stone for the garden! 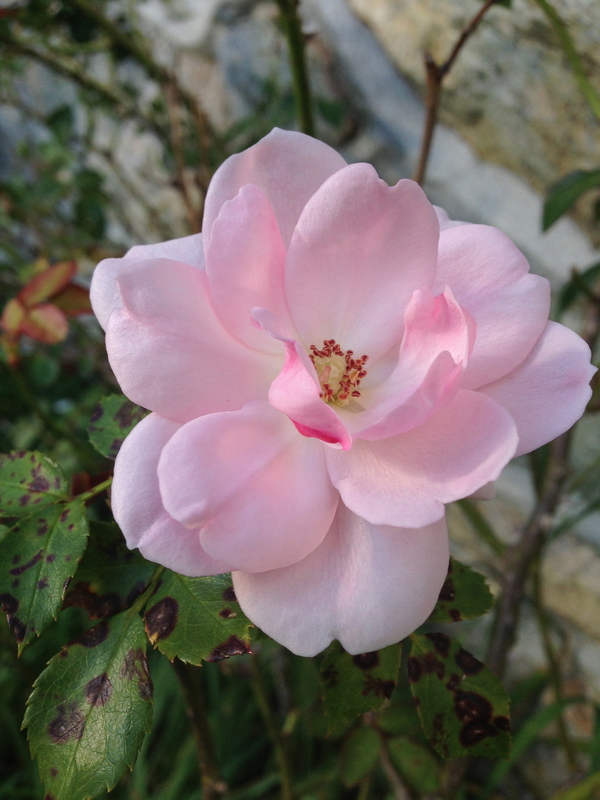 Great post; the roses against the stone, with your commentary- beautiful.